An Interview with Peter Macnair continued..
Dzunuk'wa, the wild woman of the woods, is a fearsome creature who prowls through the forests in search of children to capture and eat. Her image can be found on two totem poles in Thunderbird Park. Dzunuk'wa is twice the height of an adult, has a black, hairy body, deep-set eyes which are said to glow like coals, and pursed lips which indicate her cry "u-huu-uu-uu". Her eyesight is poor and she is vain; she is easily fooled so the captive children manage to escape and eventually defeat her. In one case, for example, she, who has great bushy eyebrows, admires the beautifully plucked eyebrows of a young noble girl. Being vain, she asks the child, "How can I have beautiful eyebrows like yours?" The child replies, "Come back to my village and my father's warrior will use his chisel to shave your eyebrows so they are beautiful like mine". Stupidly Dzunuk'wa returns to the village and puts her head down on a wooden anvil. Rather than shaving her eyebrows, the warrior drives his chisel through her head, killing her. The family of the girl then adopted the Dzunuk'wa image as one of their important crests. By vanquishing Dzunuk'wa the girl's family became wealthy because Dzunuk'wa is also the bringer of wealth. 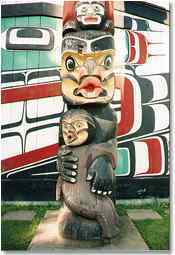 The right to use the image of Dzunuk'wa on a totem pole or as a mask is handed down from one generation to the next in a ceremony called a Potlatch. 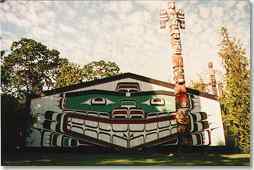 A great heraldic totem pole stands in front of the Kwakwaka'wakw house in Thunderbird Park. Painted across the housefront is the face of a giant sea monster in the form of a spiny fish called a sculpin. 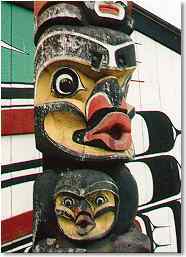 The totem pole was designed and carved by the Kwakwaka'wakw artist, Chief Mungo Martin. The bottom figure on this pole is a Dzunuk'wa who married an ancient hero at the dawn of time. She holds her son from this marriage, who is half human and half Dzunuk'wa, against her body. Emily Carr wrote about Dzunuk'wa in her book Klee Wyck. Several of her sketches and paintings show a Dzunuk'wa, but it was the first one that she saw at Gwa'yasdams village in 1912 that impressed her the most. Later, in the 1930s, she visited another Kwakwaka'wakw village known as Xwatis, sometimes called Quatsino, and there she made a sketch for an important oil painting titled the "Zunoqua of the Cat Village". Unfortunately she didn't realize she was sketching a male ancestral figure rather than a Dzunuk'wa. We must remain aware that while she was intrigued by Dzunuk'wa, she was not always able to identify it correctly. Many of the Kwakwaka'wakw villages Carr visited were unoccupied. She toured in the summertime when the entire population of the village was away working in the commercial salmon fishery or working in the canneries. As a result, there was no one available to explain the meaning of the images she was sketching.